Produced by: Naughty Boy, Mojam, Alicia Keys, etc. _Unable to go to last summer’s Belladrum Festival, I passed my entry to Phoebe Inglis-Holmes, at that time a co-presenter on Generate Radio. As my proxy she reported back extremely favourably on the whole event. One of the acts that had particularly impressed her was Aberdeenshire singer/songwriter Adele Emeli Sandé. Opting to drop her first name, Emeli Sandé has an impressive pedigree having already written for a varied range of artists including Alesha Dixon, Professor Green, Preeya Kalidas, Cheryl Cole, and Tinie Tempah. She also featured on ‘Diamond Rings’, a collaborative chart hit with Chipmunk. At the time that Phoebe reported back to me I was only vaguely aware of the Chipmunk track and her high energy song ‘Heaven’. Encouraged by her enthusiasm I listened more carefully to a range of Emeli’s work and discovered so much more than a talented writer for pop/urban artists. I was particularly bowled over by a mesmerising acoustic version of ‘Heaven’ as performed on ‘Later With Jools Holland’. ‘Our Version Of Events’ is Emeli’s debut album and serves as an excellent showcase of her talent. Like her namesake Adele, Emeli offers a refreshing alternative to standard chart fare. Lyrics are intelligent and thought-provoking with skillful instrumental backing and sympathetic orchestration. Her voice encompasses powerful and delicate, with every instrument being clearly distinguished. I do have a soft spot for acoustic guitar playing when it is also possible to hear the fingers sliding along the strings and that helps to add to my enjoyment of this album. The collection of tracks goes all the way from delicate vocals over piano or acoustic guitar to the powerful ‘Heaven’. 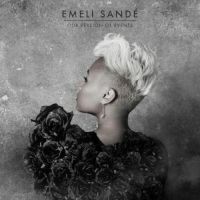 This album highlights the diversity of Emeli’s work – don’t expect it all to sound like her singles chart success; both solo and her recent collaboration with Professor Green, ‘Read All About It’. The depth of her talent just oozes out of every track. It is easy to see why she has been awarded the ‘Critic’s Choice Award’ for this year’s ‘Brit Awards’. Emeli got quite far into her study of medicine at University of Glasgow but stopped as she began to focus on her musical career. Medicine’s loss is most definitely the music industry’s gain, but reassuringly she has an alternative career to pursue should things go wrong in music. In the meantime we should be grateful to have her talent gracing the contemporary music scene. This is another album that I have yet to physically touch, but that certainly hasn’t stopped me from appreciating the package on offer. Whilst vinyl offers a very immediate tactile experience, the electronic download offers an insightful and honest video documentary (‘Her Version Of Events’), three video tracks and a beautifully designed ‘e’ booklet with full lyrics, photos and notes. For a relaxing and thought provoking alternative to driving rock or shallow pop, Emeli is a very welcome addition to the growing bank of others who also seek to bring some maturity and intelligence into modern music. I’ll leave it to others to argue whether or not Emeli is truly innovative and sufficiently individual to warrant her growing reputation – for me, she presses all the right buttons.